The lost painting of Sam Houston. 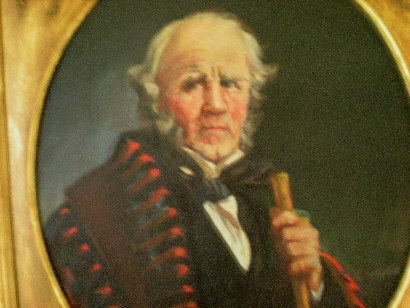 A long-lost painting of Sam Houston may be gathering dust in someone�s attic. On the other hand, given that not everyone in Texas revered the Hero of San Jacinto, someone might have thrown it in the trash or burned it long ago. Either way, evidence exists of a previously-unknown image of Old Sam. Houston was Texas� Lyndon Baines Johnson of the 19th century � big, powerful, controversial. About the only difference between the two men was that LBJ made it to the White House. But then LBJ was never President of the Republic of Texas. The story of the missing painting centers on another old Texan named John D. Nash. A Kentuckian, Nash came to Texas in April 1835. He took title to a grant of land in Lorenzo de Zavalla�s colony on July 25, 1835. When Texas began its violent pull away from Mexico, Nash participated in the Siege of Bexar in December 1835. The following spring, Nash fought under Houston when the Texas army defeated General Santa Anna at San Jacinto. When someone presented the Mexican dictator�s horse to Houston as a prize of war, Houston detailed Nash to ride it off the battlefield for safekeeping. Though Nash was a solider and Houston a general, the two eventually became friends. It was Nash who presented Houston with the wooden cane seen in one of the better-known photographs of Houston. With Texas an independent republic, Nash settled in San Augustine County. In the spring of 1841, he and Houston signed a short document in which Nash agreed to keep and feed a stallion belonging to Houston. In 1850, five years after Texas statehood, Nash won election as sheriff. After serving a single two-year term, he moved his family to Bastrop County. By 1854, he operated a ferry at a point on the Colorado River about six miles from Bastrop. Houston, by this time, served in the U.S. Senate. But on his periodic visits from Washington, he spent time on the road meeting with his constituents. Anyone traveling from Huntsville to Austin would cross the Colorado on Nash�s ferry. Lucretia apparently kept the painting, because Mrs. Miller recalled having seen it. Nash had a daughter with an artistic bent, and he could play a mean fiddle, but he seems to have focused on making a living. He clearly understood the importance of transportation. When the Houston and Texas Central Railroad laid tracks through upper Bastrop County on its way to Austin in 1871, Nash moved to a new community adjacent to the tracks, McDade. Nash operated a freight business, using the rock building as his warehouse and office. Old age finally catching up with him, he and Lucretia, who had never married, moved to Kaufman. He died there in 1888, but Lucretia lived well into the 20th century. �I don�t know what ever became of the picture and the cane,� her niece later wrote. �I did not see it when we visited her [in Kaufman]. That suggests the Houston painting stayed in Bastrop County when Nash and his daughter relocated to East Texas, but no one seems to know the rest of the story. The McDade Museum has on display a poster-size version of a U.S. postage stamp image of Houston and his cane, but it�s not Lucretia�s painting. Greetings from Nashville, TN. I am writing in response the Mike Cox�s July 2004 article about a �lost� Sam Houston painting, the article which I recently happened upon. A friend of mine here in middle Tennessee owns a framed portrait of Sam Houston, being approx 4� x 3� including frame (photos above), which I am told has been in her family as long as anyone living can recall, coming to the house where it currently resides in the 1940s; the house is listed with the National Register of Historic Places. The owner is reportedly related to Sam on both her side of the family as well as her (ex)husband�s; I�ve been told that each was a descendant of a different brother. I�ve heard mention before of the Houston family relationship; it seems every other family member has either the first or middle name of �Houston�. 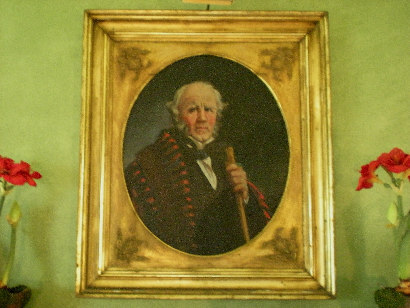 Interestingly, my friend�s painting bears striking similarity to another I found today from a Google �images� search of Sam, reportedly painted by William Henry Huddle in 1886, and displayed in the Texas State Capitol building. I am hoping that you might be able to refer me to anyone who might have knowledge re my friend�s painting. Any information or assistance you may be able to provide will be most appreciated.